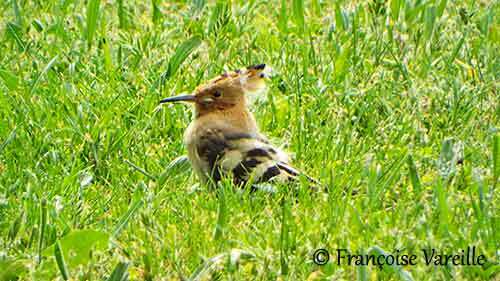 Reproduction 2017 of the Eurasian Hoopoe,with surprise! 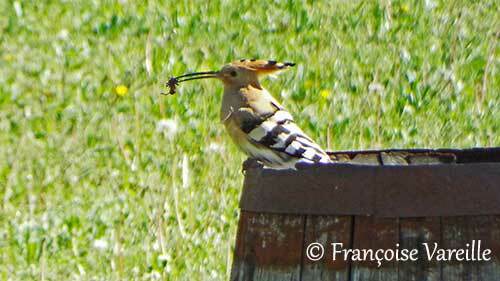 Many thanks to Françoise Vareille for this wonderful observation. The flash was not used for these photos. The light passing between the boards of the cask was sufficient for the shooting. 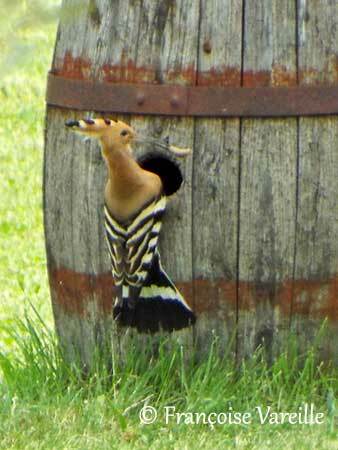 A hole at the top of the cask allows taking pictures without opening and with a minimum of disturbance for the birds already accustomed to the comings and goings around the cask for garden maintenance. 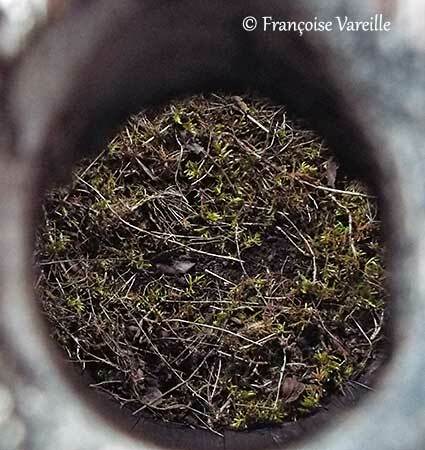 The text was written by Nicole Bouglouan, according to the notes and information provided by Françoise Vareille. 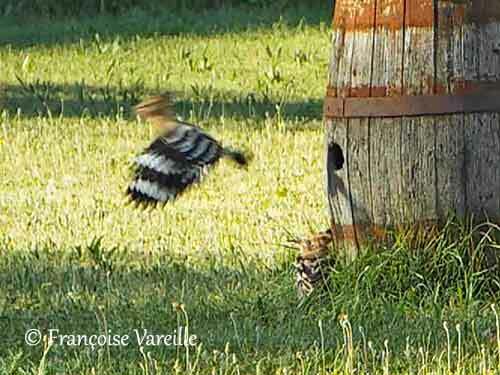 All pictures on this page are owned by Françoise Vareille. 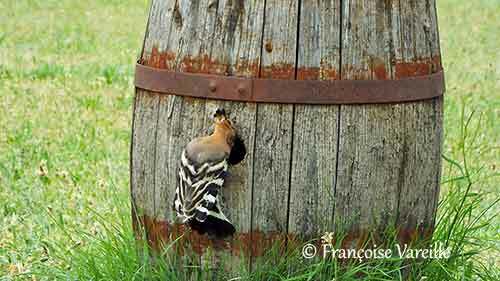 Like the three previous years, the Hoopoes are nesting again in the old cask in Françoise’s garden in Provence, France. 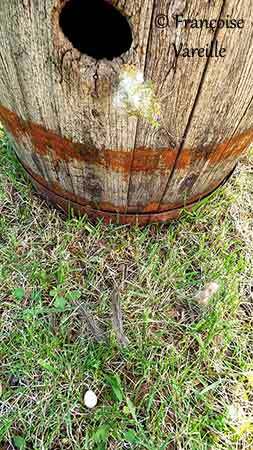 They arrived on March 19, 2017 and quickly went to the cask to inspect and settle for the 2017 season. 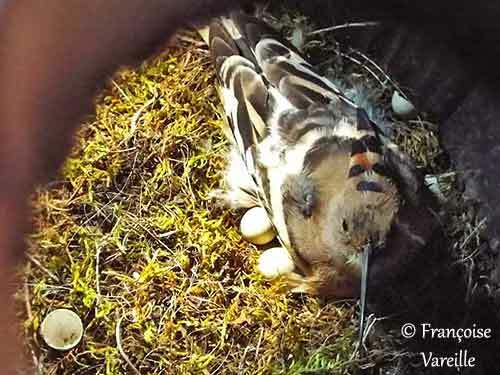 The Hoopoes are preparing the nest with fresh vegetation such as moss and grass, but these materials are added to the remains of the last year because they did not clean the cask. And two days later, the surprise! Other birds have added some white animal hair above the green moss. 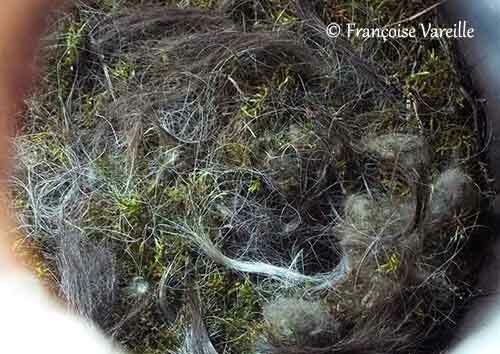 Some days later, we can see more hair and a small hole in the nest materials (bottom right). 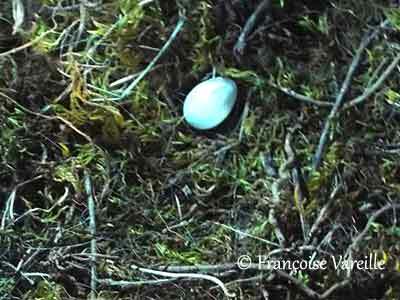 And finally, we are able to see a small egg in the tiny nest, just three days later. 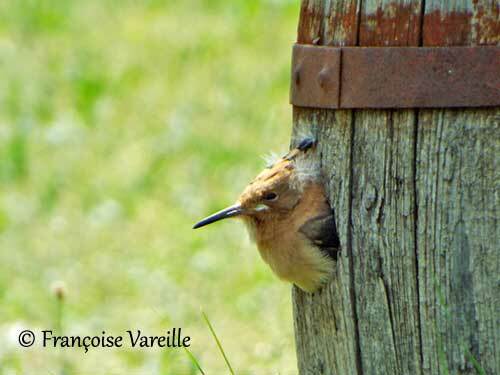 Small birds, probably passerines, have been observed near the task, but they were too far for good identification. 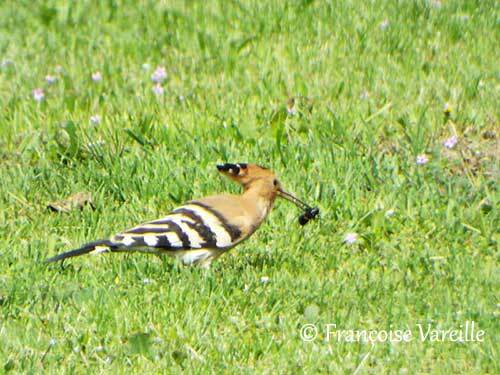 They disappeared rapidly, maybe chased away from the site by the Hoopoes. 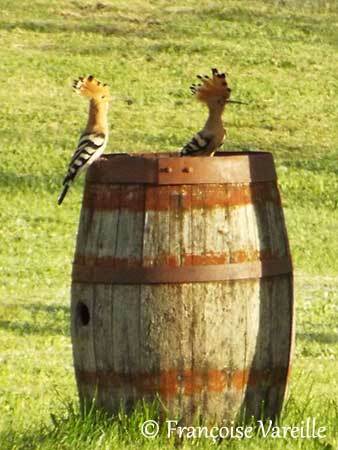 And on April 10, the Hoopoe’s pair starts to clean the cask. 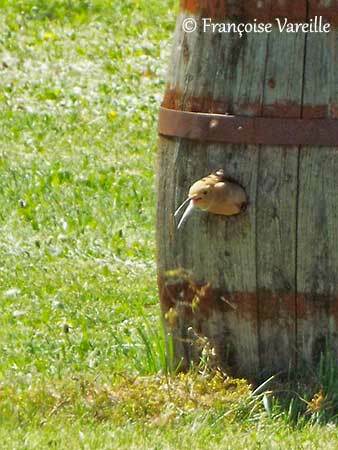 One of the birds removes and ejects the hair through the task entrance. We can see a mound of hair on the grass below the entrance. 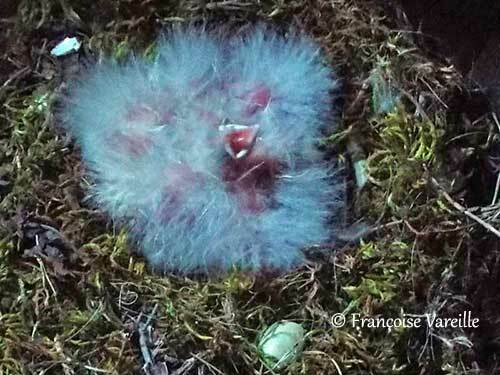 An egg is on the ground with two hair tufts, while other materials are hanging from the entrance hole. Cleaning is in progress! 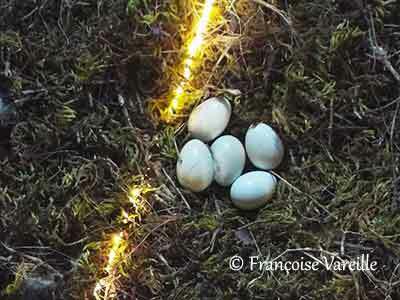 The eggs are removed too and ejected from the nest. Only one is not broken and it will be carefully observed later. 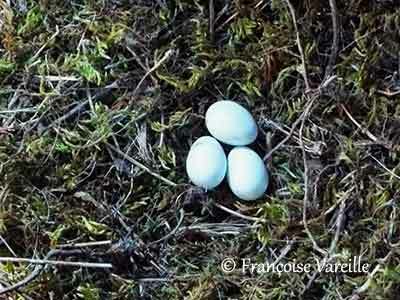 The other eggs are broken below the entrance. 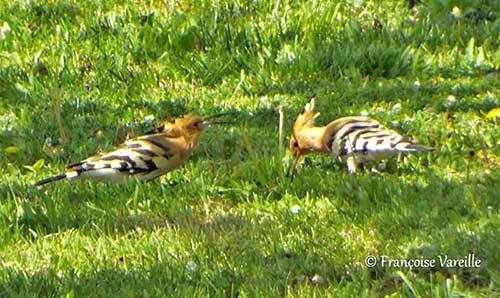 Three days later, the Hoopoes are still cleaning the nest, removing the dirty moss which falls on the grass. But surprise! 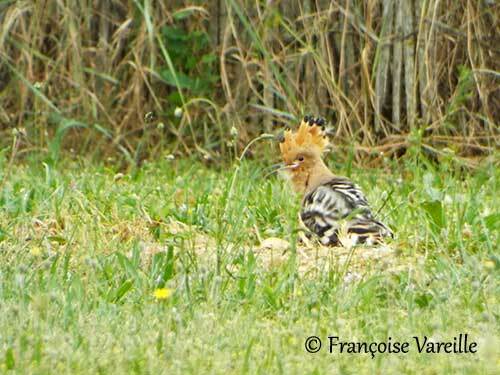 The mound of hair has been removed from the ground by the Hoopoe! Now, the nest appears cleaner. No hair, no eggs, only the small hole still visible. 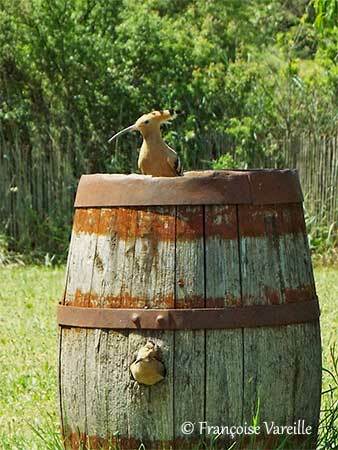 The cask is now ready to receive the Hoopoe’s clutch, probably in a few days. 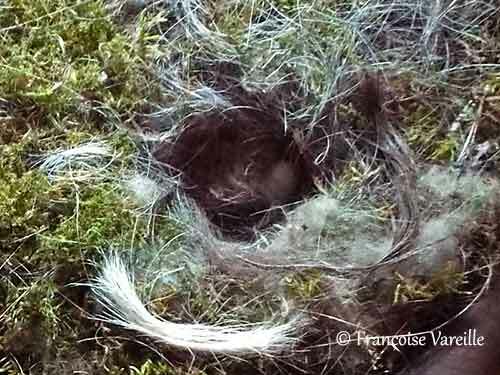 Observation of both eggs and hair removed from the nest. 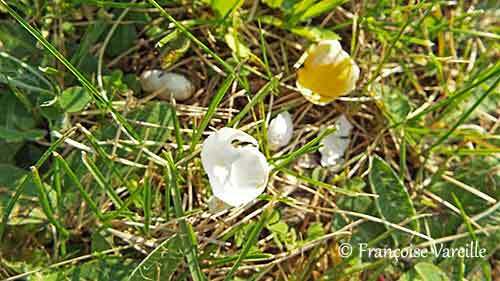 The eggs are white with scattered small orange-brown spots throughout the surface. Only one egg is not broken. It is 2 centimetres long and 1,3/1,5 centimetres wide. 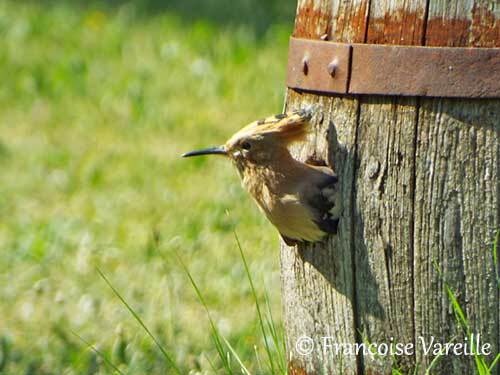 The intruders have been described as brown passerines with some black stripes on the upperwings. 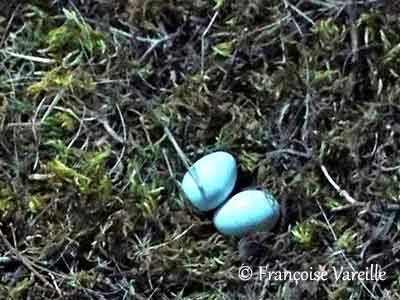 They were fairly similar to House Sparrows, but the eggs are far too clear and do not correspond to this species. 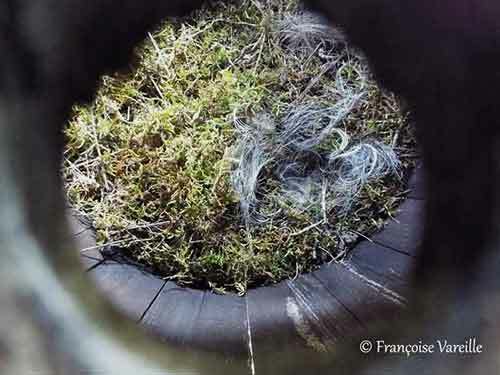 The hair is probably dog’s hair, but maybe with horse hair or sheep wool too. Now, the laying can start. 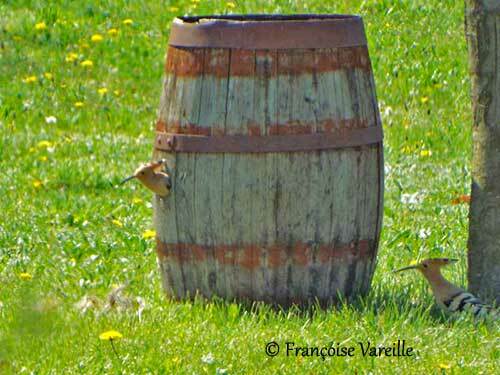 April 14, the male feeds the female outside the cask. 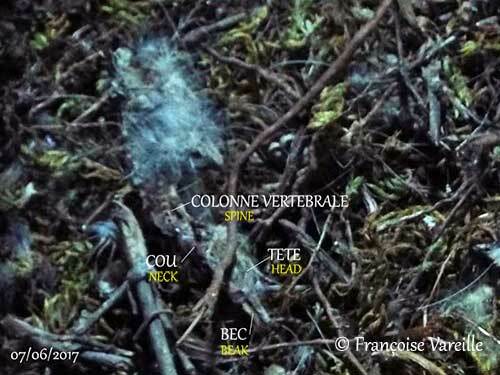 April 16, a copulation is reported in a tree near the nest. 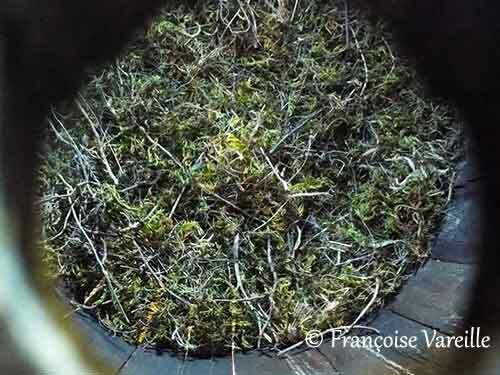 The cask is clean and ready for the laying. 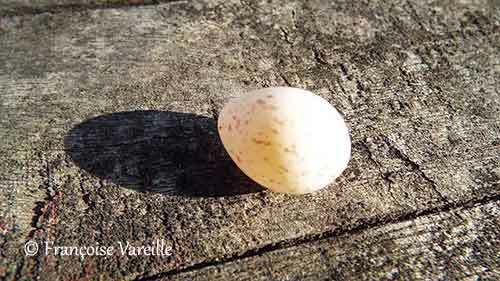 The female will lay one egg per day. She will be fed by the male. 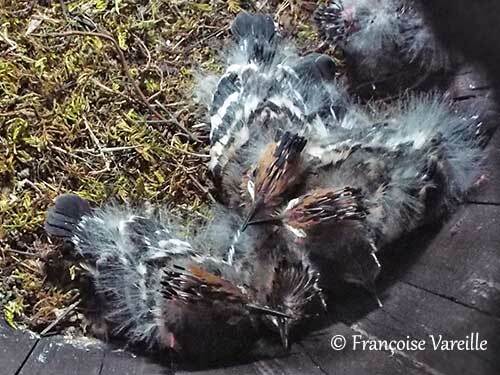 April 18, the laying begins. 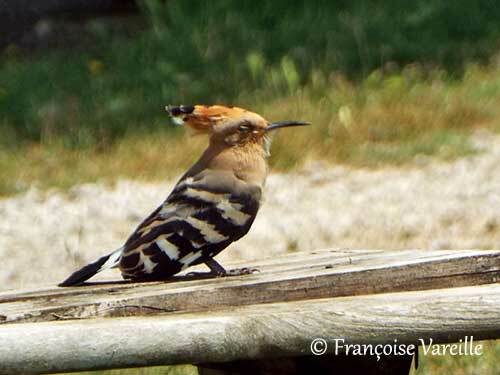 The hoopoes are well used and let the photographer working and approaching the nest, which she does quietly and silently, respecting the rhythm of the birds so as not to disturb them. The male now feeds the female at nest entrance. She rarely leaves the nest. The male is still hunting for the female. April 24, the 7th egg is laid. It is normally the last one, but do we ever know… and of course, on April 25th, here is the 8th egg! 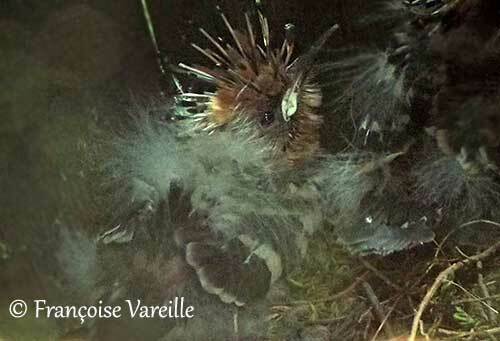 The female started the incubation after the laying of the third egg. 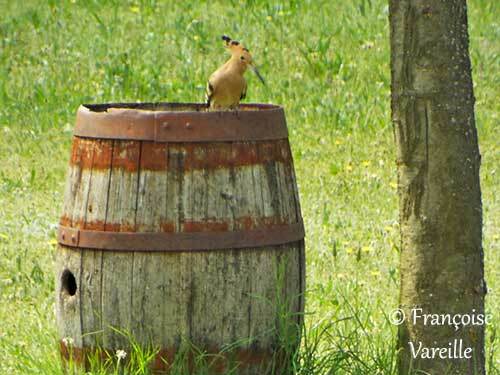 She is now on the nest, always fed by her mate which remains in the vicinity of the cask. Waiting begins. See you soon for the hatching! 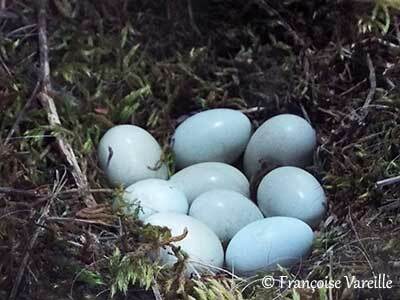 But, on April 26, the 9th egg is laid during the night! 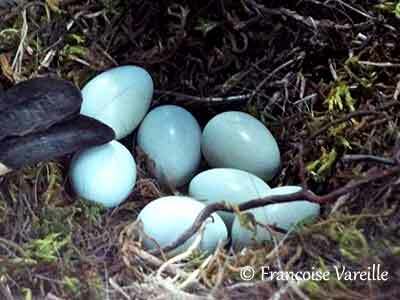 This species may produce clutches of up to 10-12 eggs. We'll see! 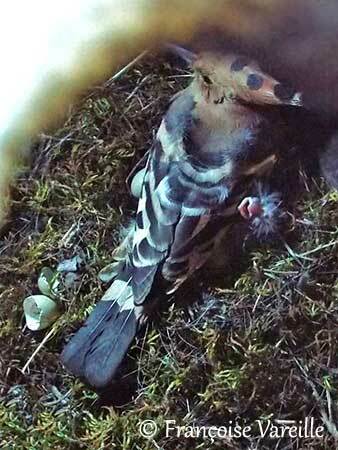 Two chicks hatched on May 6! They are naked, with some white down and red skin. 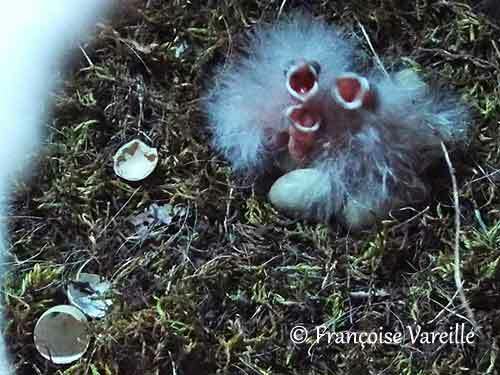 The chicks have yet white down, and the third egg hatched on May 7. 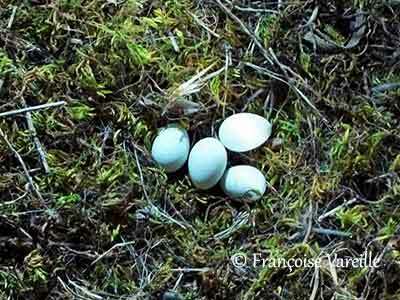 The female incubates the remaining eggs and the downy chicks, while the male is still hunting for the family. 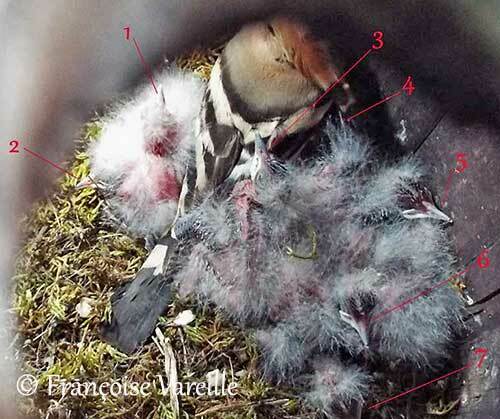 On the picture below, we can see the complete brood with seven (or eight) chicks on nine eggs laid. One of the chicks is dead but the corpse has been removed, like the remaining egg. 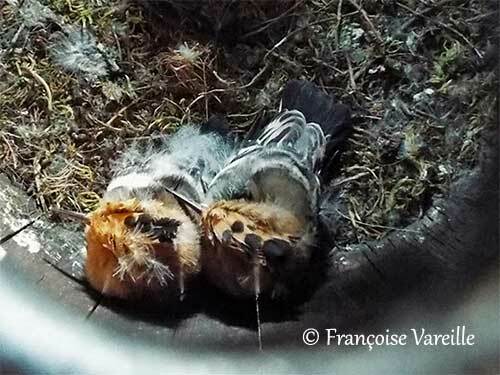 This time, the nest has been cleaned by the female! The seven chicks need some space! The two youngest chicks are placed among the oldest ones, the second and third from the left. 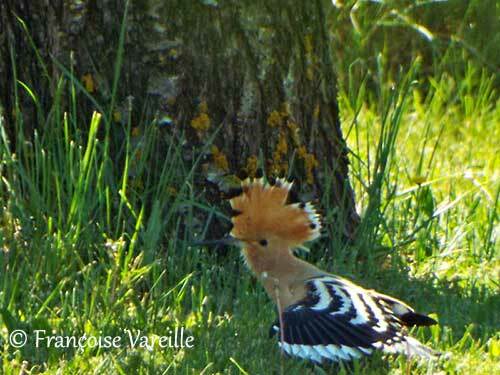 They have shorter crest feathers. Maybe again a kind of protection from the oldest birds? And some of them are very hungry !!! 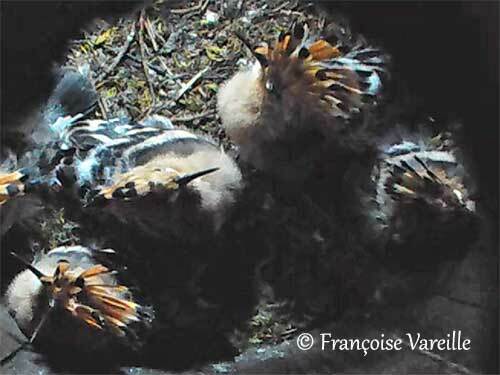 On May 8 in the evening, the photographer finds 5 downy chicks very close to each other. 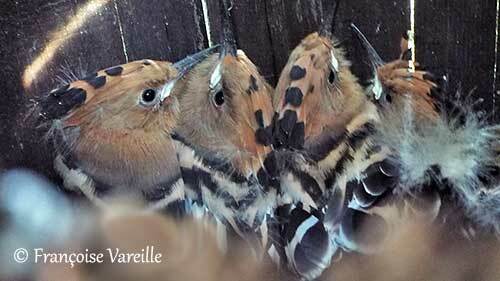 On May 9, the female is with them. One chick is brooded, while the four others are begging for food. And the male feeds continuously its family. 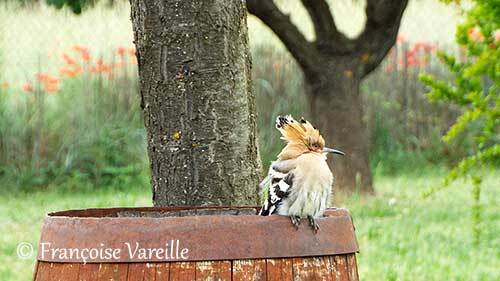 The male is still feeding the family, and sometimes, the female joins it on the cask. 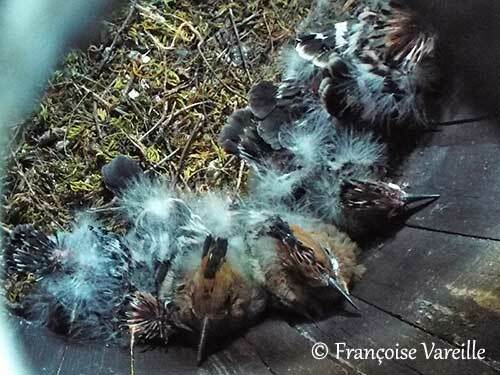 On May 12, it is difficult to see how many chicks are in the nest, maybe 6 or 7. The feather shafts are yet visible. They are growing up very well! Now, the female feeds the young too. 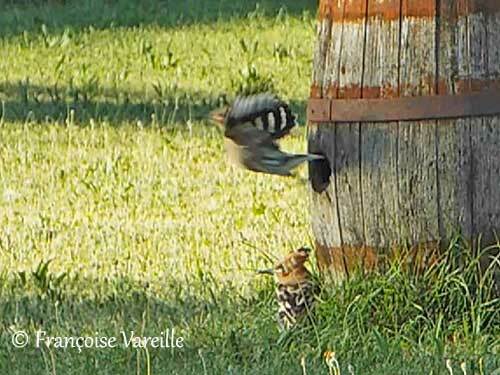 Below, we can see the female with a prey in the bill. 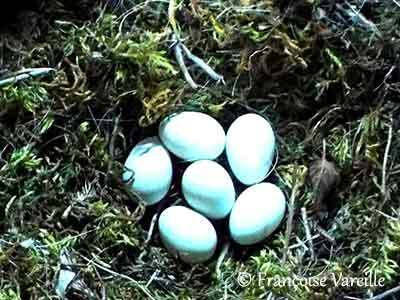 On May 13, there are 7 chicks on 9 eggs. What a beautiful clutch! Both parents feed them. 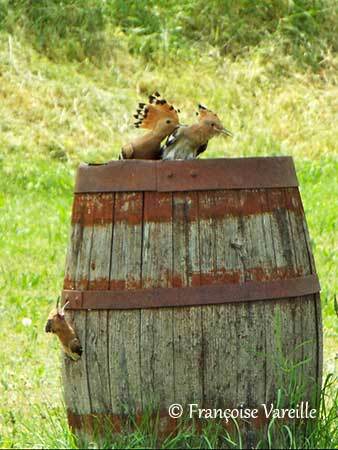 They are growing quickly and well, because the prey are abundant in the vicinity of the cask. Chick's appearance on May 15. 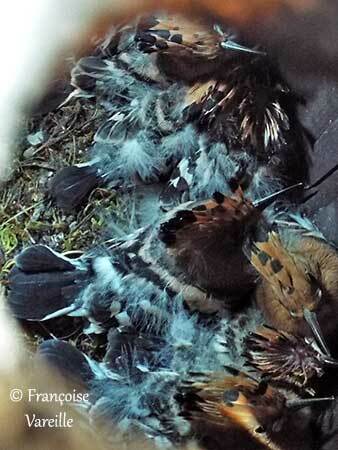 The feather shafts become conspicous. 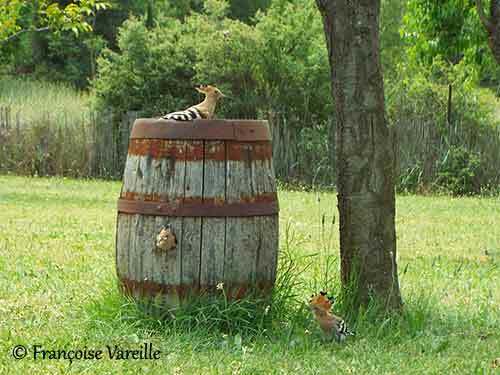 Today, for the first time, the chicks were hissing while the photographer was approaching the cask. 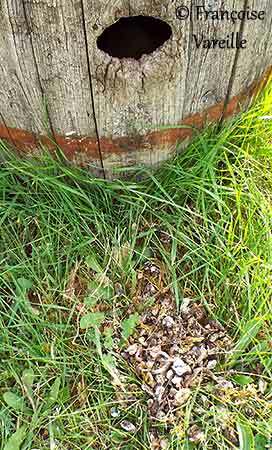 A very bad smell is noticeable when approaching the cask due to both droppings and debris that accumulate on the lining. 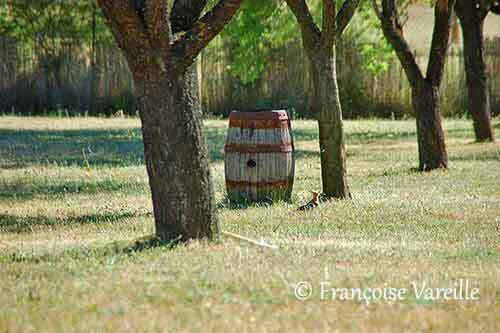 It is used to keep the predators away from the nest. 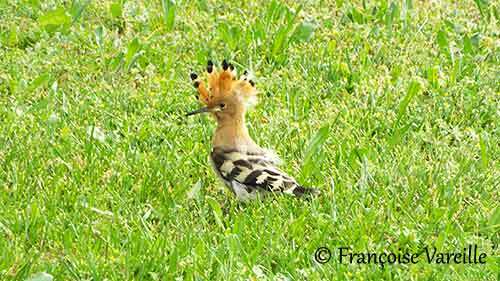 On the picture below, we can see the growing head feathers. The shafts are very conspicuous. They are growing very fast. They have yet the colour of the adults on their heads! 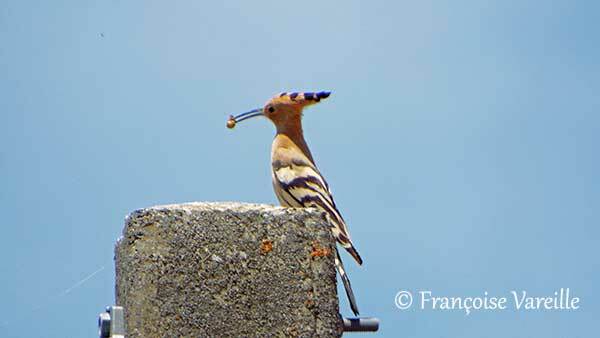 Today, the crest is conspicuous, but wings and tail are growing well and the bill is longer too ! Now, their appearance is changing every day! 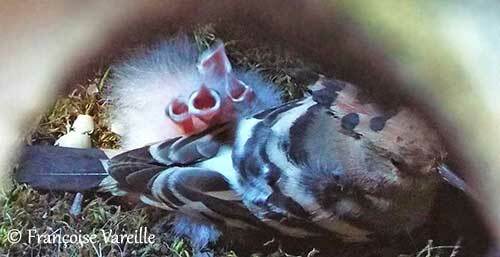 The feathers are growing fast! 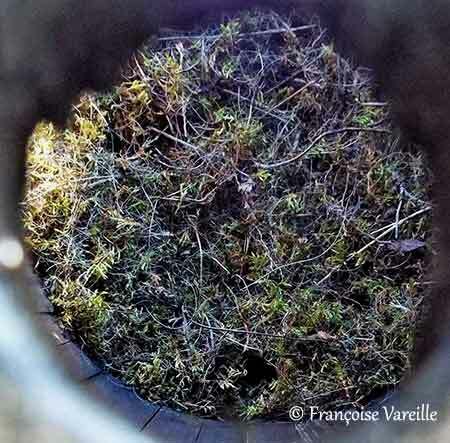 On the picture below, we can see the droppings all along the sides of the nest. 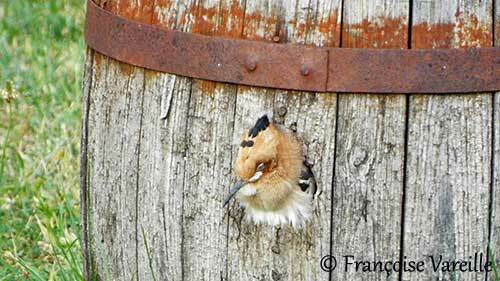 The chicks usually defecate along the rear wall of the cavity, here the cask, involving quickly a foul-smelling nest-cavity! 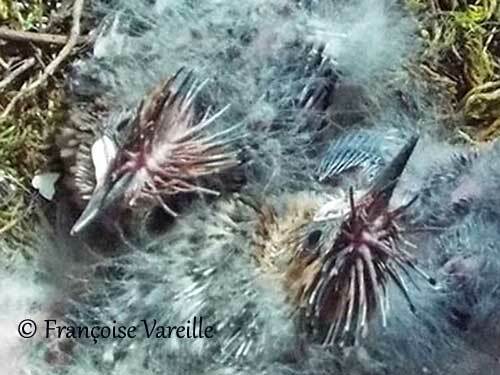 In the same way, a dead chick is not removed from the nest (Reproduction 2016: OBSERVATION REPORT ). The bad smell is used to keep the predators away from the nest. 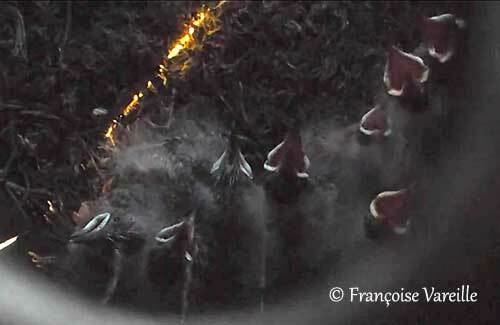 The female regularly removes the droppings by tossing them through the nest entrance. 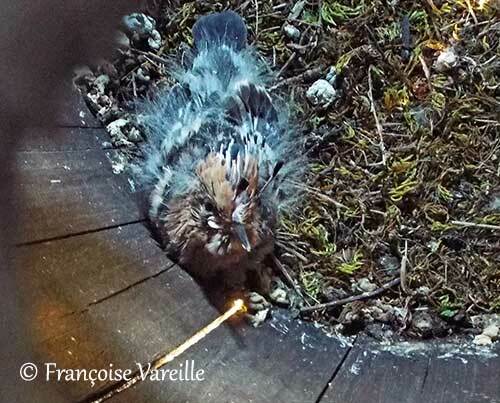 Later, the chicks themselves often defecate through the nest entrance, at least when it is larger. 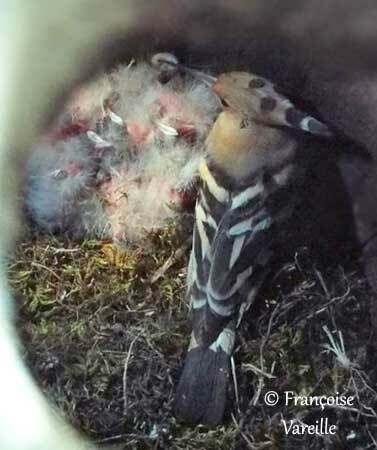 Here is the result just below the nest entrance! 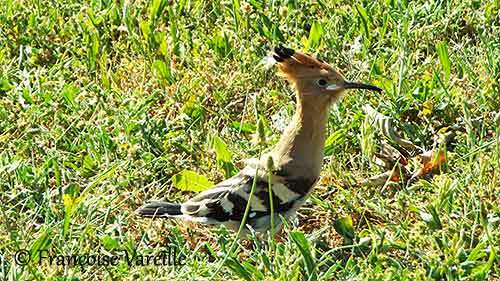 The picture below shows the latest chick on the left. 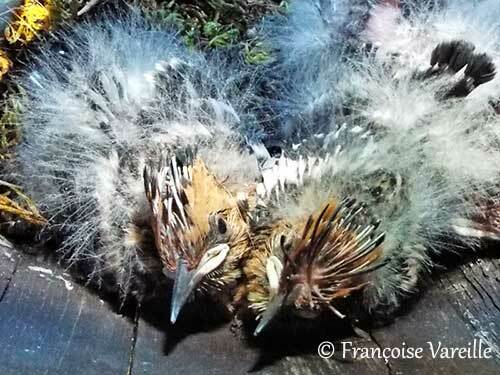 Compared to the following chicks on the right, we can see that tail, wings and crest feathers are not completely grown because the shafts are still visible. 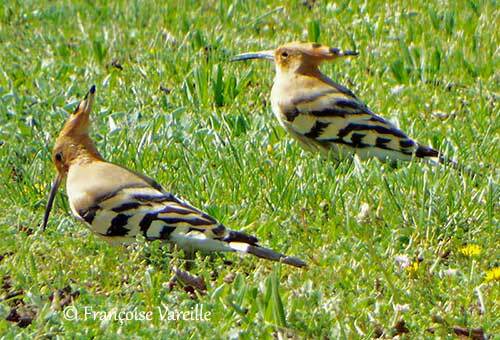 The male is still feeding its family, here with the female. The prey are abundant in this area. They are growing very fast! Almost ready to leave! 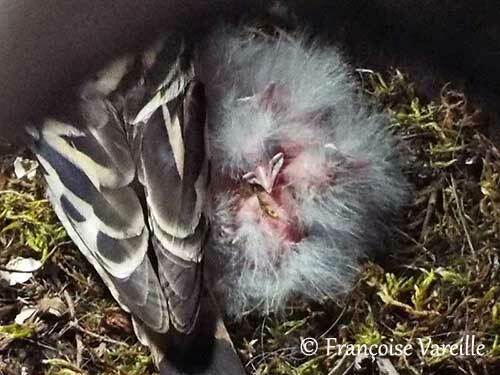 The white gape is less conspicous (it allows the adults to see the bird in the darkness of the nest). The bill is longer and the crest too. 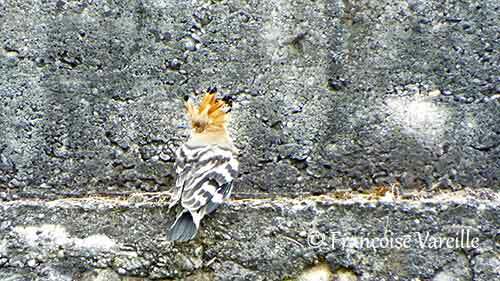 The young bird is well feathered and will fledge very soon. 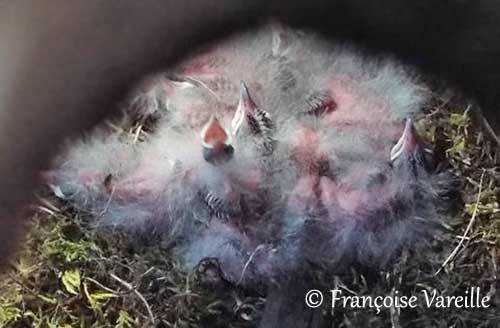 There are seven (or eight) chicks waiting for leaving the nest. They will fledge synchronously. One day later, they are very similar to their parents! 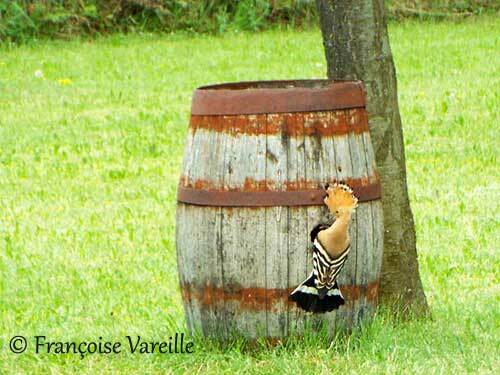 And on May 28th, the first chick comes to the entrance and looks outside the cask! Some white down is still visible on the head. 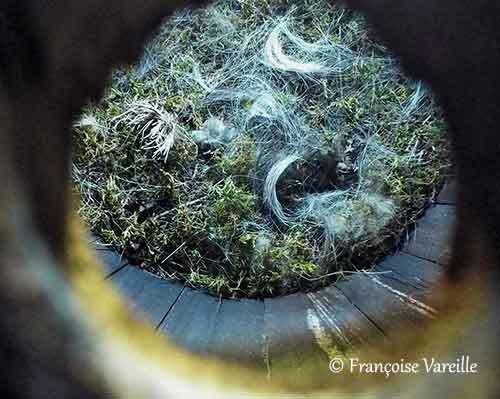 It had inhaled the air, looking up, down and below the hole, resting quietly "at the window" before retruning inside. This is not the good day yet! 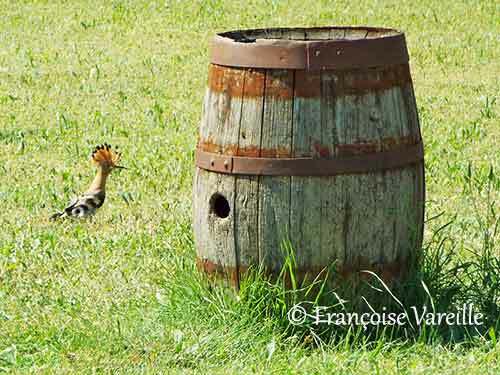 On the following picture, we can see an aggressive behaviour from the largest chick, alarmed by a movement outside the cask. 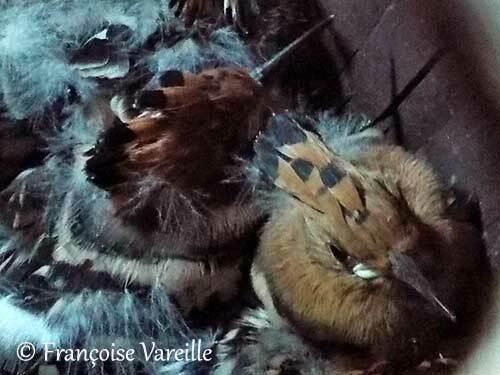 It erects the body while fluffing its plumage and fanning the crest before to produce a short hissing sound. 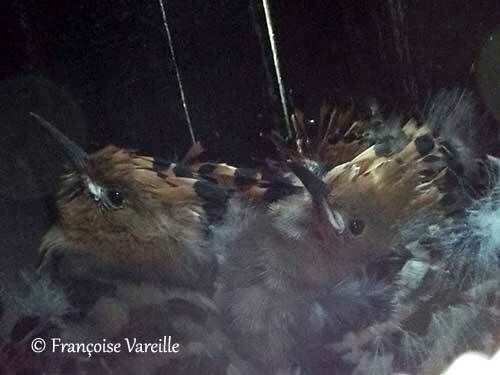 But later on May 28th, the photographer saw two heads at the window!!! This garden is so beautiful! Be careful though! Predators are on the lookout, but fortunately, this one is too big to enter. 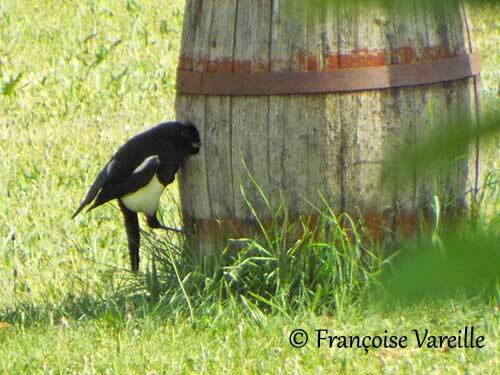 It is an Eurasian Magpie! Every effort deserves encouragement! 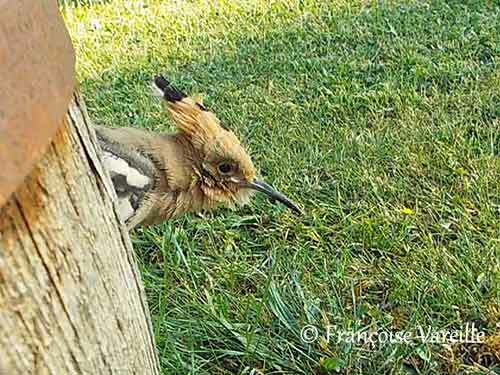 The fledged young helps the next to come to the garden! 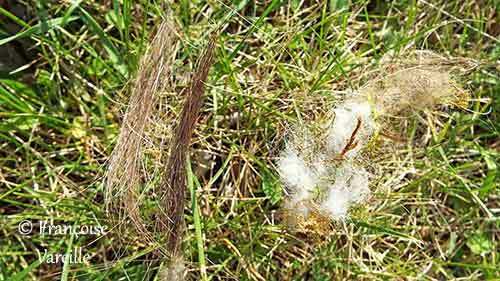 It must be said that there are traces of childhood with a few tufts of white and silky down. Besides, the sunlight is blinding ... Shall I go out? Here we go! What a joy ... I fly! Long live freedom! The grass smells good and it is very soft. Awesome!!! 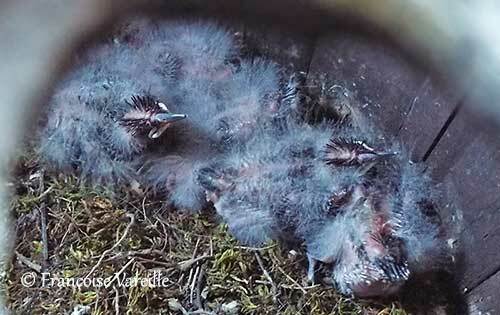 Still three nestlings on May 30th. Who is it now? Not ready today ... Tomorrow will be another day! 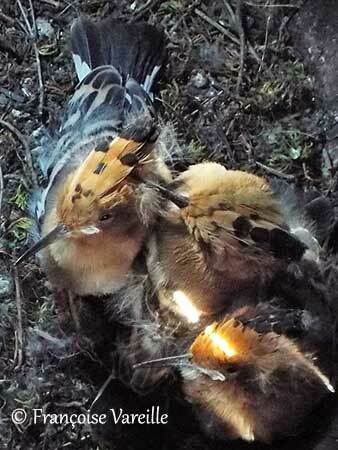 Sad new at the end of the day: a young bird is found dead. It has no apparent wounds. It was one of the elders of the brood. On May 31st, the youngest ones are starting to emerge. They are a little sleepy and wait for food. The youngsters are discovering the garden and rest. They must get accustomed to the light of day and to a more playful scenery ! The others take some fresh air quietly. It's really a great day !!! 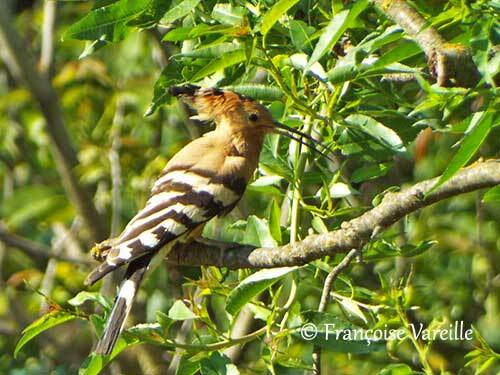 Even my hoopoe opens well ! 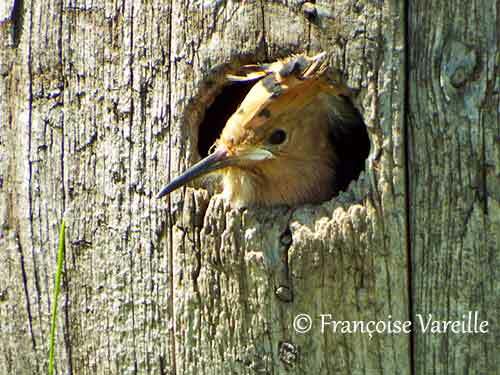 On June 1st at noon there was only one chick left in the nest. 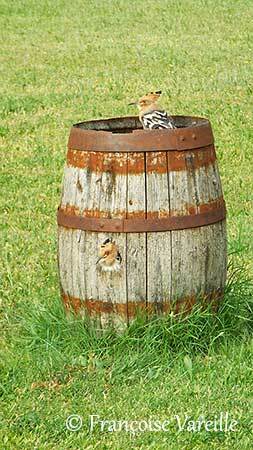 But tonight, another chick joined it in the cask. 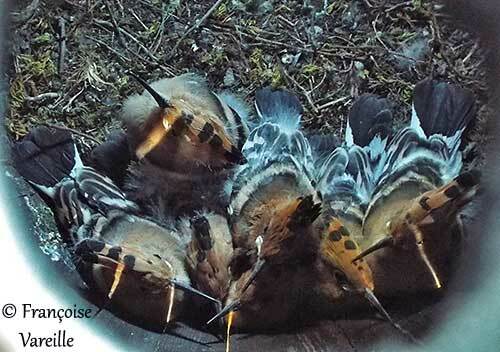 They will sleep at nest one night more. We see very clearly that the chick on the left has the tail feathers much shorter than those of the other chick on the right. It will have to wait a little more time before flying. 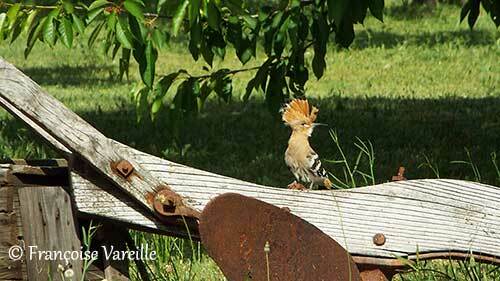 The young is discovering the garden while the perched female watches around. 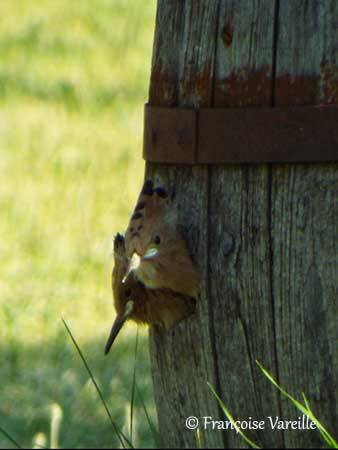 Another young stretches under the nest entrance. They need to do some exercises after two weeks inside the cask. 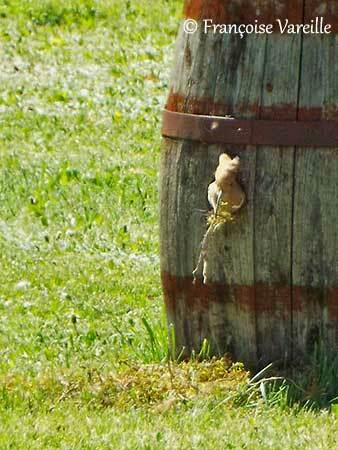 This one visits the youngest bird. 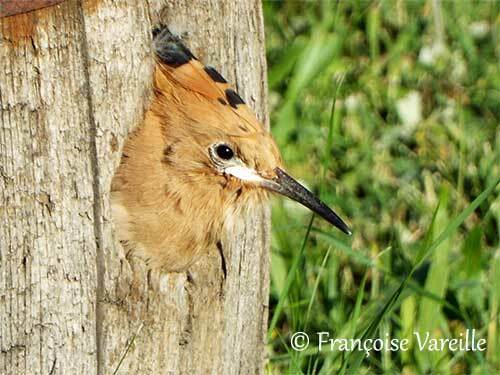 The young remain in the vicinity of the nest where they may feel safer. The female guards above. 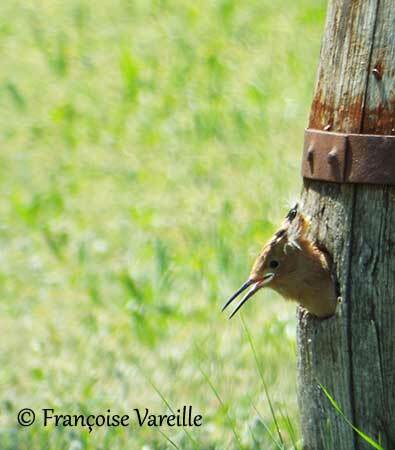 The female is scolding one of the youngest which since then has returned to the nest! And the next day, we can see again what has already been observed above: the older ones protect the younger ones. 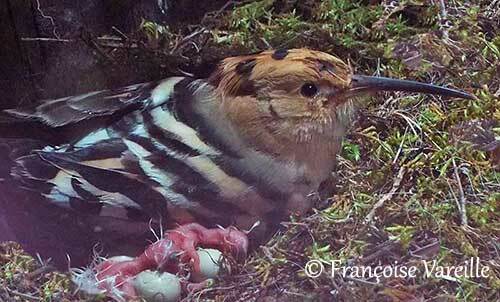 Could this be a way of helping parents who are already busy feeding other young hoopoes? 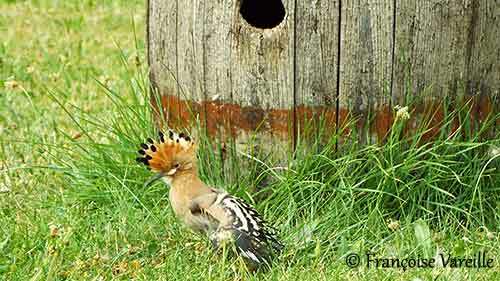 This behaviour is not uncommon among birds. 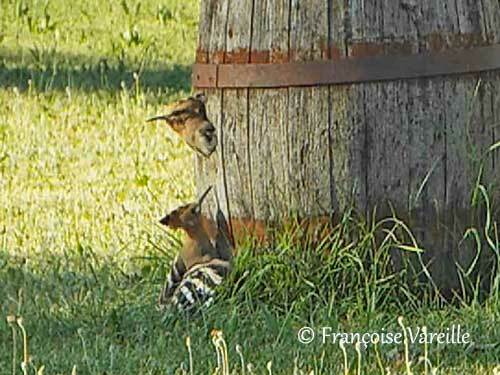 In the late afternoon, a young returns to the cask to spend the night with the youngest chick. 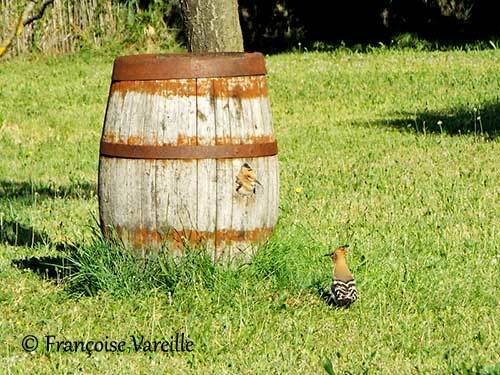 Here, a young hoopoe enjoys the sun after two weeks in the cask ! Like a little childhood, a little white down persists on the crest. 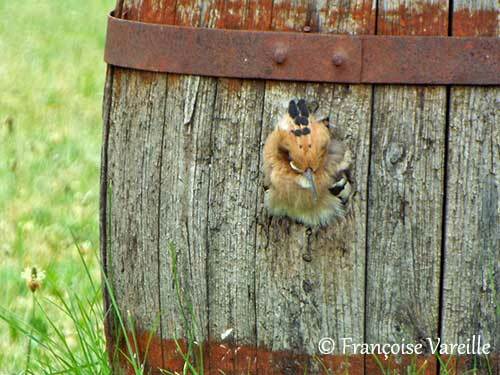 As if to give a sign of hope, the female returned to land on the cask this morning of 3 June. The second brood may not be long. Last year, the first egg was laid on June 11th and the last one on June 17th. Wish them good luck ! The pair arrived on March 19, 2017 for the 4th consecutive year. 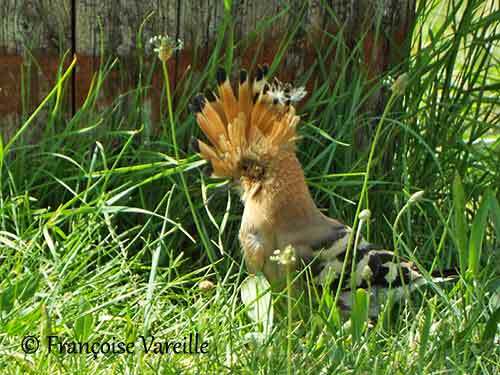 Following some problems with intruders at the very beginning, copulation was observed on April 16, probably preceded by a few others. 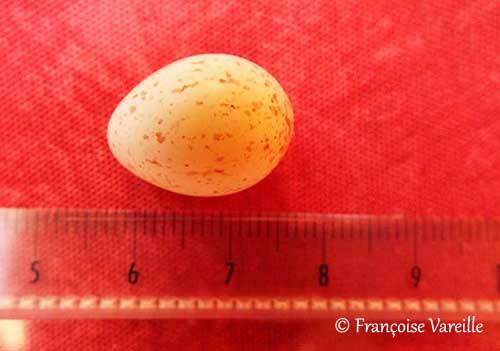 The egg laying started on 18 April and ended with the 9th egg on 26 April. 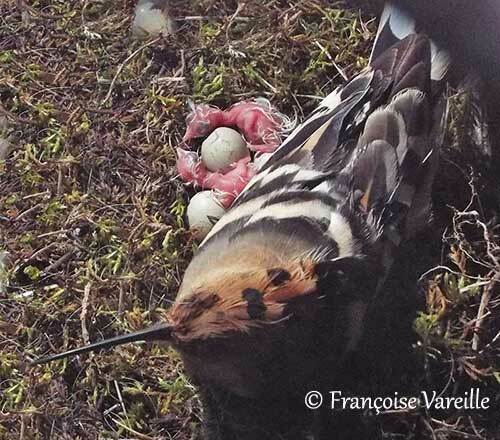 The female is often fed by the male during the incubation which began on 20 April after the egg laying of the 3rd egg. But she leaves the nest from time to time for foraging. 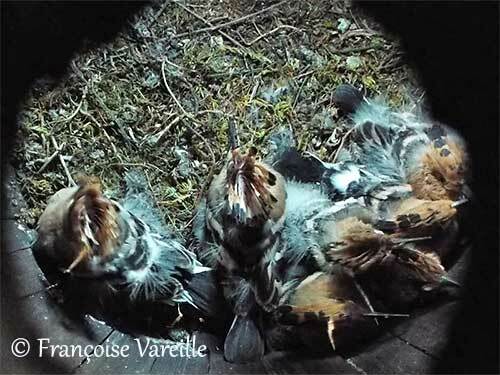 On May 15th, 8 chicks were present in the nest. One of them disappeared very quickly. So there are 7 living chicks. The cycle ended June 3rd in the morning. 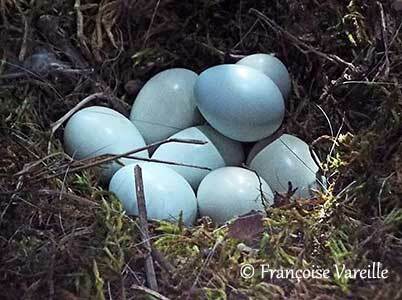 There were a total of 9 eggs laid. One of them did not hatch and disappeared from the nest. 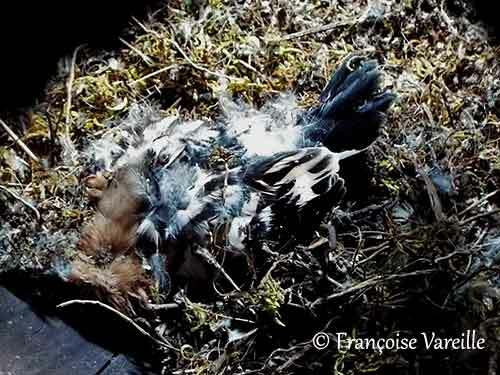 A chick disappeared very quickly and his corpse had to be removed from the nest because it was not visible at any time. 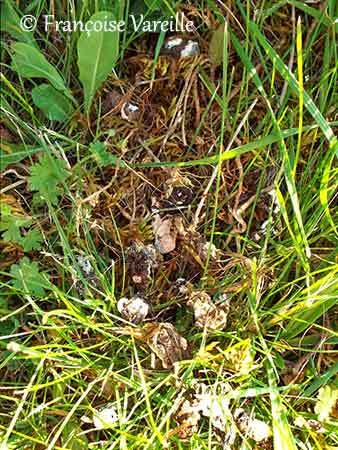 But the bones found on June 7th are perhaps its remains. 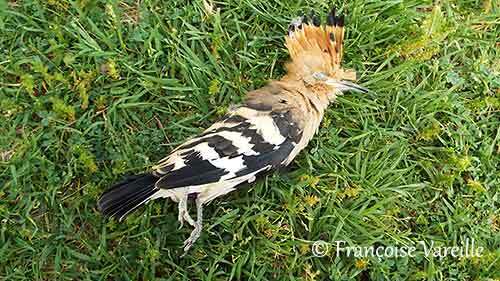 One of the elders was found dead in the garden 24 hours after leaving the nest. No trace of wound, blood or fracture. 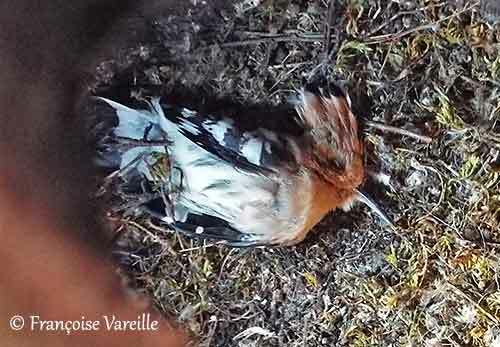 The last born was found dead in the nest on June 3rd in the morning. No trace either. 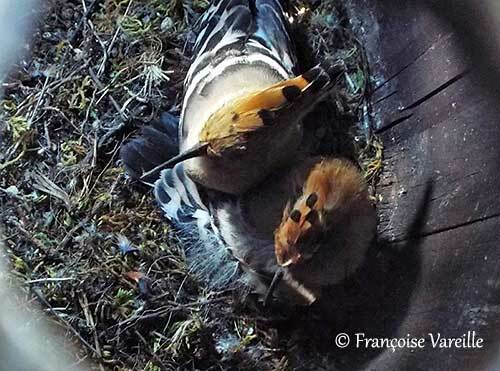 And on June 5, while the female is still on the top of the cask, another chick has been found dead at nest. This is probably the other "newborn" that showed some signs of weakness with especially half-closed eyes. 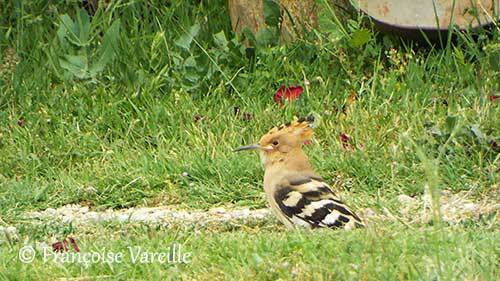 The brood produced 4 juveniles currently present in the garden. 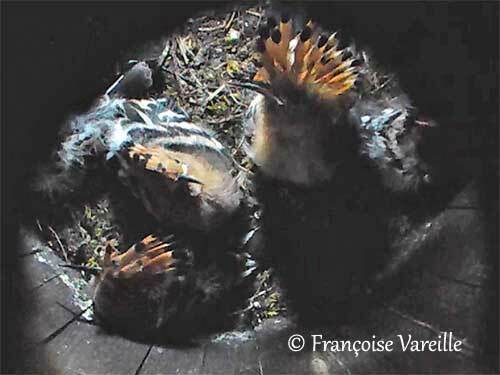 The parents will feed them for a few days, before beginning a second brood. 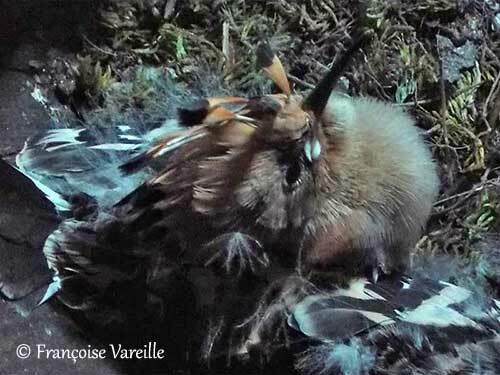 Bad surprise on June 5th ... Another juvenile was found dead at the nest. 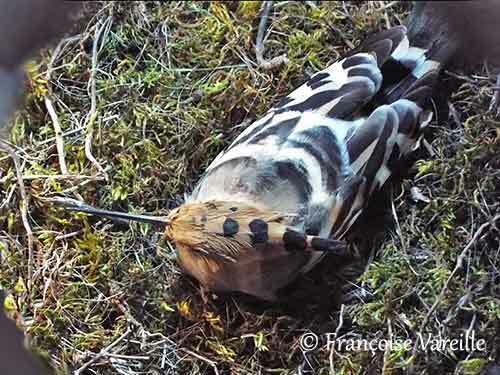 Several problems may have caused his death, like ingestion of chemicals contained in the prey, malnutrition, bad weather ... He returned to die where he was born. Back to the starting point.